I'm a little late posting my Tuesday project. Better late than never right? Here's a frame I made for Ethan's 3rd grade teacher, Mrs. K.
The Green polka dot pattern paper was a very bright BoBunny paper. I white washed it with some acrylic paint and water. Love the tone down look....I inked the edges with vintage photo distress ink. 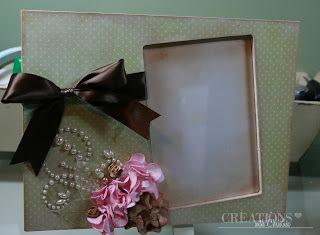 The satin ribbon is just a wide piece I had in my stash. 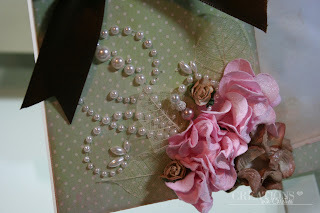 I used some Eline Prima Pearl bling and those beautiful flowers are petals from IamRoses.com. I sprayed the flowers with Marshmallow Glimmer mist and added some mini roses (also from iamroses). Stuck behind the flowers are some small skeleton leaves (yep Iamroses) and a beaded stick pin, you probably can't see the pin in the picture..
What a lovely gift for Ethan's teacher. Lucky her. It was very thoughtful of you. Love the green paper you used as well as the pearls. I can never seem to find them at my Michael's. Beautiful, she is going to love this gift! Very, very pretty! Great job on this one, Christina .. I've had frame fever too but all mine are wrapped now and no photos. Love the addition of the stick pin! The frame is gorgeous. I love the colors and the ribbon. I am sure Ethan's teacher will love it. Something different ye something she can have for a long time. Beats creams and perfumes. LOL.